Going into Fantastic Beasts: The Crimes of Grindelwald, it was clear that J.K. Rowling had a number of secrets she planned to reveal. 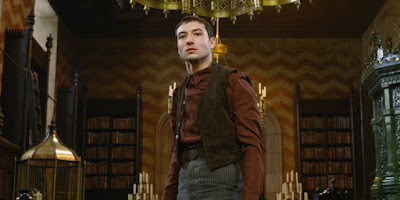 There were too many left dangling at the end of the first film for there not to be, and to some degree, we all had to know that Ezra Miller's character, the destructive orphan mage Credence Barebone would be at the center of it. In the first film he was basically a force of nature, an Obscurial powered by rage and fear. But that wasn't enough to prepare us for the shocking twist at the end of this latest film, which has left fans of Rowling's Wizarding World crying foul. The big shock at the end finds Credence, who has joined the side of the evil Grindelwald, learning that he is actually the previously-unknown Aurelius Dumbledore, the younger brother to Albus, played by a roguish Jude Law. Um, it makes no sense. Given that Rowling wrote the screenplay, and she knows this universe better than anyone, obviously, she must have some idea of where she's going with this. She must also have some idea of where it's all coming from. I'm currently reading through the Potter books now, and questions about Dumbledore being forthright with information about himself persist throughout. It's always possible this is one of those things he chose to keep quiet, for whatever his reasons may be. On the other hand, the complicated jumble of subplots that lead to the Credence/Dumbledore revelation, plus the fact it comes from the unreliable Grindelwald, make the whole thing very dubious indeed. So what do you make of it? I don't know how in the world there can be another Dumbledore who is so much younger than Albus, but maybe those of you more familiar with the timelines can explain it to me. Fantastic Beasts: The Crimes of Grindelwald is in theaters now. Sound off in the comments!